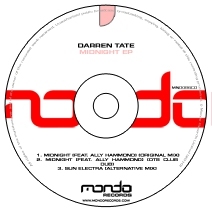 On the back foot of the huge summer re-release of Darren Tate and Jono Grant's 'Let The Light Shine In' we continue our 'Ten Years Of Tate' celebration as Darren notches up ten years at the forefront of the British music industry. With the impending release of the eagerly anticipated third instalment of Darren's 'Horizons' album series, we thought we'd hot up your summer by providing you with a sneak peak of what's to come in the form of this exclusive three track EP. 'Midnight' is a perfect example of why Darren is where he is today. With its soaring vocals (from stunning newcomer Ally Hammond), cutting edge production and truly emotional melodies this is a perfect example of music that only he can deliver. And for those preferring a less vocal take the dub does equal damage to the club floor when it comes to the peak time clubbing hours. To complete the EP we're giving you an all new version of the massive 80's inspired electro-trance workout 'Sun Electra' (which originally featured on 'Horizons 02').